Home / Articles / Wearing gloves to serve food? If you are selling food in the hawker center or food court, do you need to wear gloves to prepare and serve the food to your customers? Many times, we eat at coffee shop or hawker stall, the same person who serve us food with bare hands also receives cash from us with bare hands. How would you feel? I am sure you have seen how your order is being served especially when you are eating at a hawker stall. Do you think that they should wear a pair of gloves so that their bare hands do not touch the food? Many people think that cash (currency notes or coins) is most dirty because everybody handles cash with bare hands. Passing over hundreds or thousands of people’s hand, you can imagine how dirty it can be. How would you then expect your orders be handled? You may feel that it will be best that the hands that serve you food wear a pair of hand gloves. However, can you be sure that the gloves are clean? What if while he has just prepared your order wearing the same pair of gloves and during the preparation, he may have touched raw meat? Or he has just received cash from other customers without taking off the same pair of gloves? Or even worse, what if he has not changed his hand gloves since he started working at the stall that morning? The gloves may not be clean and can be even dirtier than bare hands. If not gloves, would you rather prefer him to wash his hands before he brought you the food you have ordered? Thus, wearing a pair of hand gloves does not guarantee cleanliness. And let’s talk about food safety. 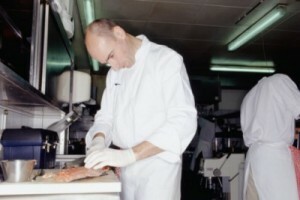 Are you sure the hand gloves he is wearing are safe for handling food? Not all gloves are food safe unless they have compliance with accepted standards such as American FDA (Food & Drug Authority) food handling requirements. Many gloves may release unsafe materials to the food. The key question, as far as food sellers are concerned, is how to prepare and deliver food to the customer’s table so that the food is delicious, nutritious and safe for their consumption? There is no standard procedure to achieve that for every food stall. It all depends on how the food is prepared and served. Let us take a chicken rice seller as an example and start from the kitchen. Assuming that the kitchen is clean and foods are processed following Good Manufacturing Process. Our discussion here is, do they need to wear hand gloves in preparing the raw chicken before putting it to the pot for cooking? The answer could either be “Yes” or “No”. Washing your hand before cleaning the chicken is all you need while preparing the raw chicken for cooking. You do not need to wear hand glove to keep the chicken clean unless you want to protect your hands from the wet work. I would put on a pair of dry and clean hand gloves if I am going to wash and clean a lot of chicken for quite a long time as I do not want to get eczema or nail-bed disorders due to fungal and bacterial growth. Wearing a pair of impermeable hand glove will protect my hands from the water and animal fats while I am washing and preparing the chicken for cooking. However, my hands may still be wet and macerated due to sweating. I have to keep my hands dry by regularly drying my hands and my gloves because a sweating hand inside the warm rubber glove is also a perfect environment for bacterial and fungal growth, causing skin diseases like eczema. So, what happens if your hands sweat profusely in the gloves? Does that mean wearing gloves may not be the answer to protect your hand from wet works? Does that mean you have no choice but to do the washing and cleaning with bare hands and contract skin diseases in long run? No need to worry, there is a solution. If you opt to wear gloves, you can apply sweat reducing hand cream or lotion to your hands before wearing gloves. If you opt not to wear gloves, you can apply water repelling hand cream (it must be food safe of course) to your hands, instead of wearing hand gloves, before starting the cleaning works. Such hand cream could protect your hands from the water or animal fat also but you have to re-apply after a few hours. Now, let’s get back to the chicken rice business. After cleaning the chickens, you cook them. I presume that the temperature you use to cook them will kill all germs present in the raw chickens. After cooking the chickens, some chefs they cool the chicken in cold water to give the chicken meat nice texture. Most chicken rice are served with the cold chicken. You can see in the chicken rice shop that somewhere near the person who is chopping the chicken into pieces, the whole cooked and cold chickens are hung on hooks and arranged nicely in row waiting to be chopped. During handling of the cold chicken, until they were chopped into pieces and served on a dinner plate with rice to the customer’s table, the hands must be cleaned thoroughly with hand soap if you prefer to use your bare hands. Frequent and repeated washing of hands may be necessary if you are doing something else that possibly cause your hands to be contaminated. Also, make sure that there is no wound or any kind of skin disease on your hands. If you do not want to wash your hand too many times (repeat washing hands too many times with hand soap can be worse than wearing hand gloves in term of eczema) or it is just not practical, then you have to wear hand gloves. You can wear either disposable (single use) or reusable type of hand gloves. They must be food safe (safe for food handling). The most common disposable hand gloves are either made of 100% natural latex rubber or 100% nitrile (a synthetic rubber) rubber. Single-use (disposable) hand gloves give best dexterity but limited hand protection because they are thin as compared to the reusable types. The reusable gloves on the other hand are thicker giving better protection to hand. Many, however, find that they can not work effectively with the hand gloves. This is mainly because they are wearing the wrong size gloves, either too large or too small. Allergic to protein contained in the natural latex is another problem. If you do develop skin allergy after wearing the natural latex gloves, try the nitrile. There are however increasing reports now on allergy to nitrile glove. You can choose gloves made of some other materials. For the cold (cooked) chicken handling, disposable types would be better than the reusable because first of all you do not need a high level of protection to your hand. The main purpose of wearing the disposable gloves is to prevent food contamination by hands. Disposable gives the best level of dexterity because most of them are skin-tight like Doctor wearing their surgical gloves. Remember to change the disposable gloves once broken. Disposable latex gloves are quite easily torn or broken due to abrasion. Nitrile glove has a higher level of resistance to puncture and abrasion. Nitrile gloves however may cost you more than the latex gloves. Wearing a pair of broken or torn gloves will not be safe for both hand and food. Take them off immediately, wash your hand with hand soap, dry them and put on a new pair of hand gloves. One last thing, do not forget to wash your hands with gloves if you are doing something else that may contaminate the hand gloves. If they are disposables, you may as well change a new pair. Unless you keep your hand gloves clean at all time, wearing hand gloves does not guarantee food safety. It is therefore a matter of choice and that is absolutely your discretion. The primary purpose of wearing hand gloves is in fact to protect hands. You should put gloves on if you need hand protection in whatever you do. If hand protection is not necessary, you can use bare hands. Frequent washing hands with hand soap could be more effective than wearing gloves and it is absolutely perfect to handle food with bare hands if your hands are clean. However, if you do not want to wash your hands too many times to make your hands vulnerable to microbial infection, you have no choice but to wear gloves. If you do that, you have to make sure the gloves on your hands are kept clean at all times during the process of food preparation and serving to your customers.